I picked her up yesterday and we headed over to Capitol Hill, where we had a faboo lunch at Banana Cafe. It’s just up the street from Stitch DC – if you haven’t tried it, you must. I am forever grateful to stitchcounter for introducing me to it (and for several other things, but she knows what they are, and they don’t need to be made public. *hug*). I had my favorite Ropa Viejas, and Yorkie had the Puerto Rican Piononos (I think I spelled those right, but if not, cut me a break – I took 6 years of French). After we ate, I ordered a Cuban Sandwich to take home for hubby’s dinner because he LOVES them, and Yorkie and I each enjoyed a caipirinha while we waited. Yum! After I dropped her off, I came home just before the skies opened up once again and found TWO packages by my door. As I pulled into the driveway, I saw one sitting there (the other was inside the storm door), and I thought it might have been my KnitPicks needles. (Um… yeah… I finally ordered them) But when I looked closer, the side of the box said “Perishable”. What on earth could it be? 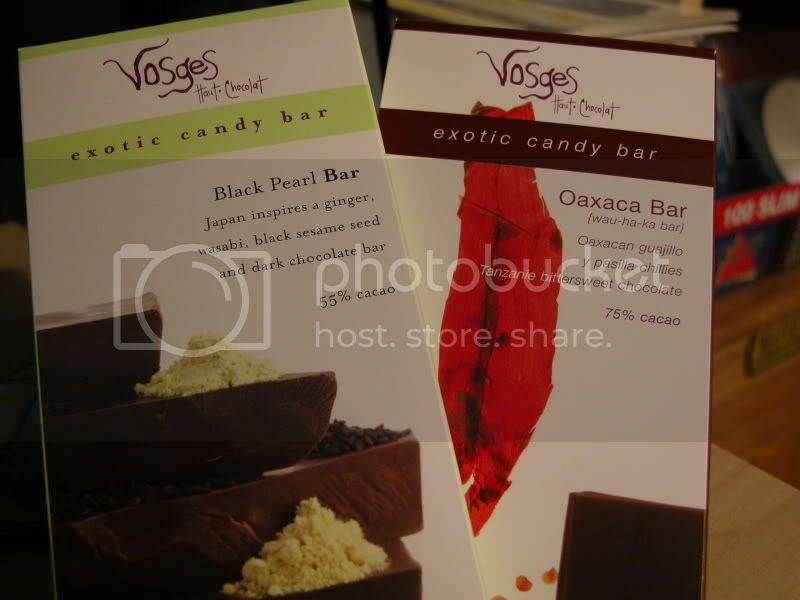 I looked at the label – the return address was Vosges Chocolates. Curiouser and curiouser! So, I opened the box, and the inner styrofoam to find two incredible-looking chocolate bars, and a note that read “Hi Pamela! Just wanting to share my favorite chocolate with you. – Your Summer Fling Pal”. Wow! I couldn’t believe it! On the left is a Black Pearl Bar (which of course made me smile just from the name, what with the POTC love in this house. You remember the socks, of course.) 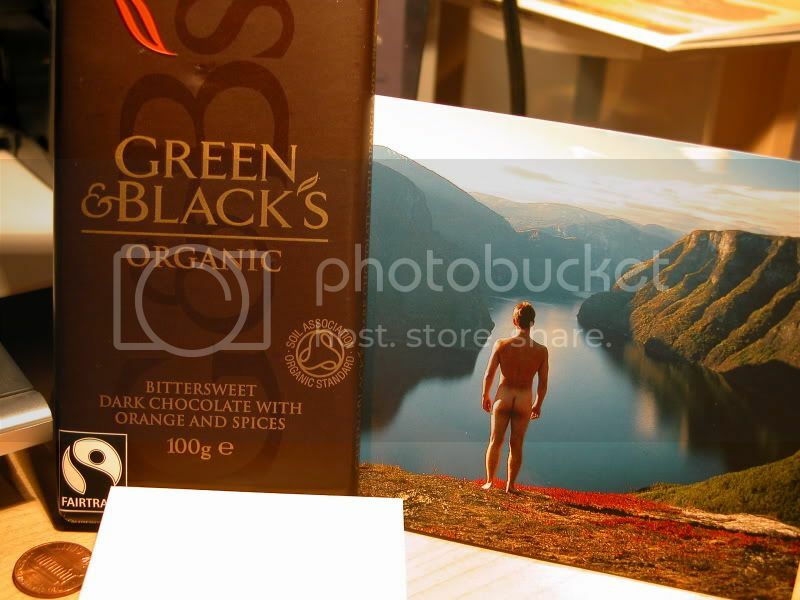 It is dark chocolate with ginger, wasabi, and black sesame seeds. On the right is a Oaxaca Bar (And something about saying “Oaxaca Bar” makes me think “Wonka Bar”. I’m a dork.). This one is bittersweet chocolate with guajillo and pasilla chiles in it! Holy smokes! I cannot wait to try these! Thank you so much, Don’tPanicTrillian!!!! And the other box was my elann.com order! 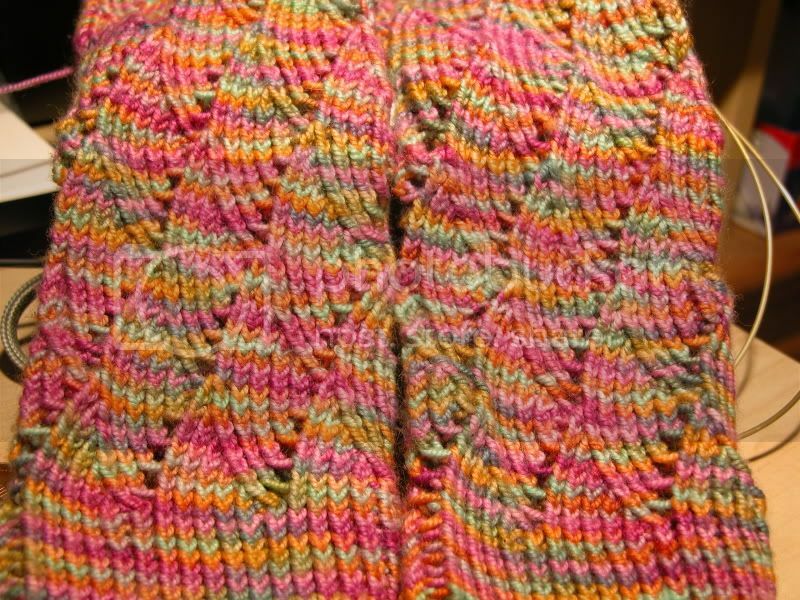 Some Connemara in “Cocoa”, which will become the new Sizzle pattern from The Garter Belt, and some Esprit in Jade, which will be Mon Petit Chou from Knitty (once I size the pattern up a smidgen). You want pics? OK, here you go (click ’em if you want to see them bigger). Also, the Linen Print. Tell me that’s not an awesome color. And for 40% off? It appears that most of the reason it was on sale (aside from being discontinued, I think) was that these balls were no longer neat and tidy, so people wouldn’t buy them. The yarn isn’t mangled at all, but there are some loose loops of the yarn on the outside. In actual knitting progress news, the Bombshell Tee has once again made it to the waist ribbing section. I think skipping the short rows was definitely the way to go, although I did tweak the front darts a little, because they were puckering and I wanted some extra length before the waist. So, I did them every other row, alternating with plain knit rows, but finishing with the same number of stitches. I am also doing some extra rounds of ribbing. I’ll decide exactly how many once I try it on again. I reeeeally hope this is it for this top. I know I’m going to love it, but damn is it taking forever. 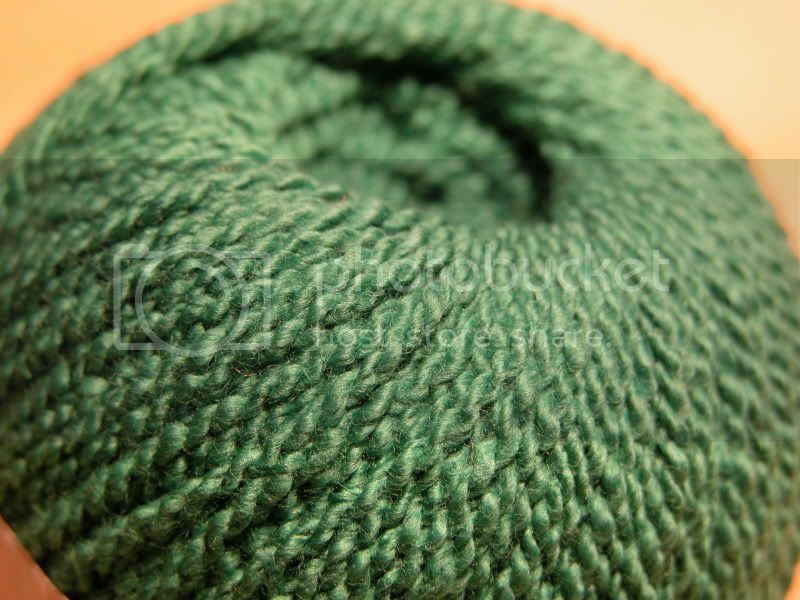 Hopefully, the postal gods will smile on me, and when I get back from the B&N SnB today my KnitPicks needles will be here. If they are, I’ll brag about them here. 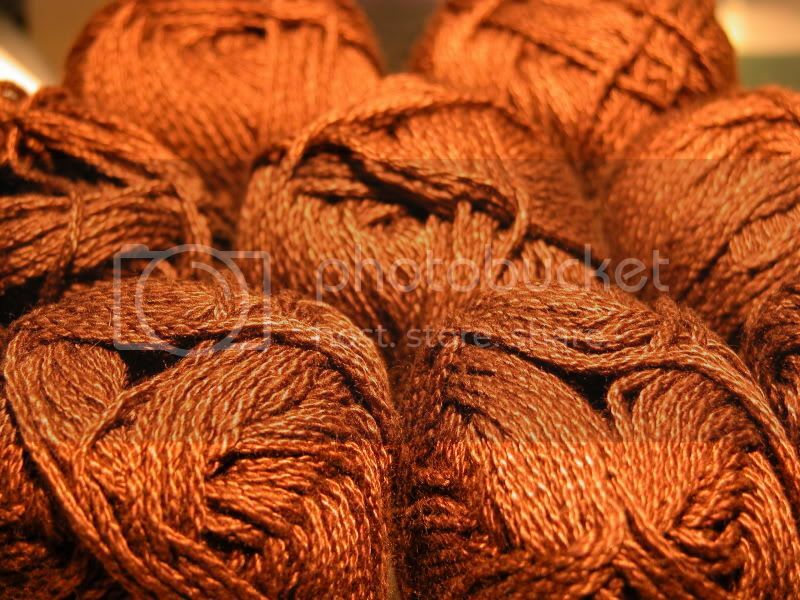 July 13th, 2006 | Tags: Knitting, Knittyfolk, RAKs and SP Stuff, WIPs, Yarn Acquisitions | Category: Misc. 12 comments to Yorkie Day! The Connemara will be gorgeous for Sizzle. Sounds like you and Yorkie had a great time. Stitch DC looks like a gorgeous shop. Beautiful yarn, and what lovely gifts! Lucky girl. I’m about to cast on for Sizzle, myself. I’ll look forward to seeing your progress. Love the socks, by the way. I’m so jealous, yarn on sale (! ), fabulous chocolate, and Banana Cafe?! Makes me wish I were still in town. Oh well, maybe we can squeeze it in during the next visit. Oh I’m so jealous! Wasn’t she coming somewhere in NC? I forgot it was so soon! 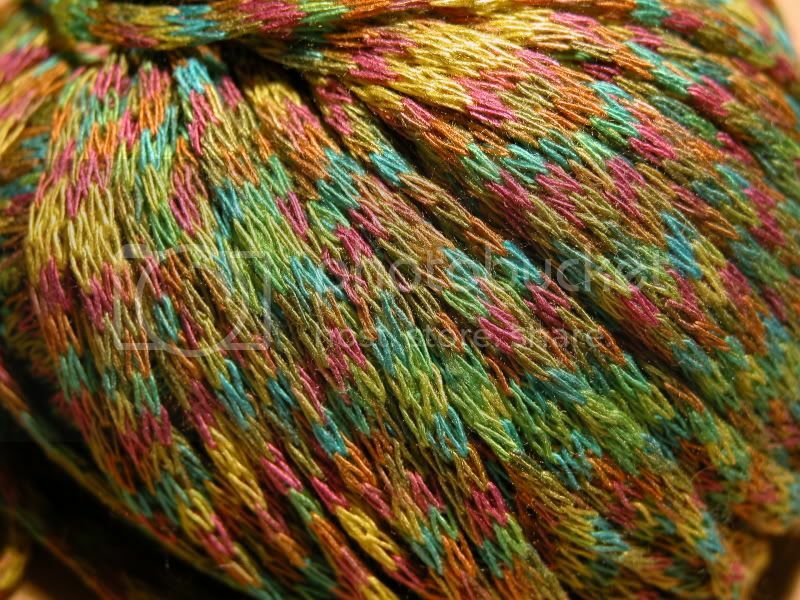 Nice new yarns too! Ooh the pr0nny goodness! Hey, where’s our pic? Kris is still delaying it’s release. Must be taking lots of photoshopping huh? Looks like a really nice time, I love the yarn display they have. What a great time you had! Thanks for the tip about the restaurant. And the yarn? Gorgeous! Great post. Wow, you and Yorkie, you and Turtle, you and Bryghty! Love, love, the elann.yarn and your socks are the prettiest I’ve seen. Seriously.